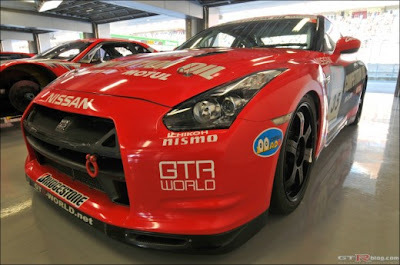 Kris over at GT-R Blog got a chance to be a little intimate with the Tokachi R35 GT-R at the recent Nismo Festival. Thanks to Kris for taking these photos. Its always interesting to see what the race car guys do with a car. The areas they address that need improvement. I have spent some time with Super Taikyu versions of the R34 GT-R, and they taught me a lot about racing and Japanese race car preparation. 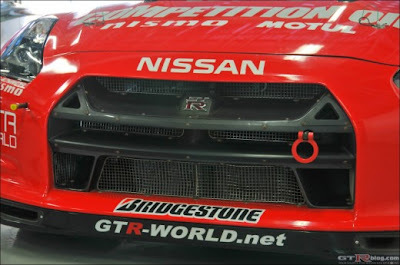 The additional holes and vents in the front bumper show the need, as always for extra cooling in a race car. The 24 hour car had twin oil coolers, where the factory car has one. 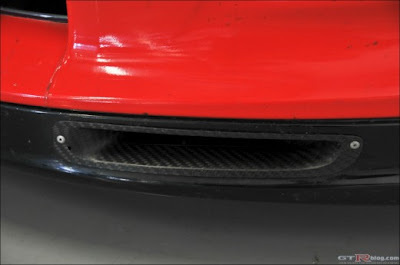 It also seems to use about every inch of the nose to get cool air to the radiator. The brake ducts in the front bumper are very small, and honestly look very inadequate for this car. That is maybe why they had about 5 sets of complete front calipers standing by for the 24 hour race. There were also small vents that directed air to the back of the rotor that I noticed in once of the photos. The problem with an all wheel drive car and front mounted calipers is getting air into the center of the brake rotor to cool it. If you ever get a chance to look at a Group A R32, or some of the more serious R34 time attack cars, you will notice they moved the caliper to the rear of the rotor. Everything needs coooling. This aluminum duct is used to direct air at a cooler. 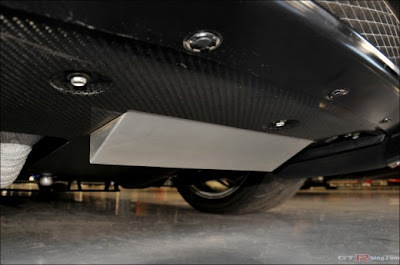 This ducts are very small to try and cool the 380 mm rotors on a car that weights nearly 4000 lbs in full race trim.